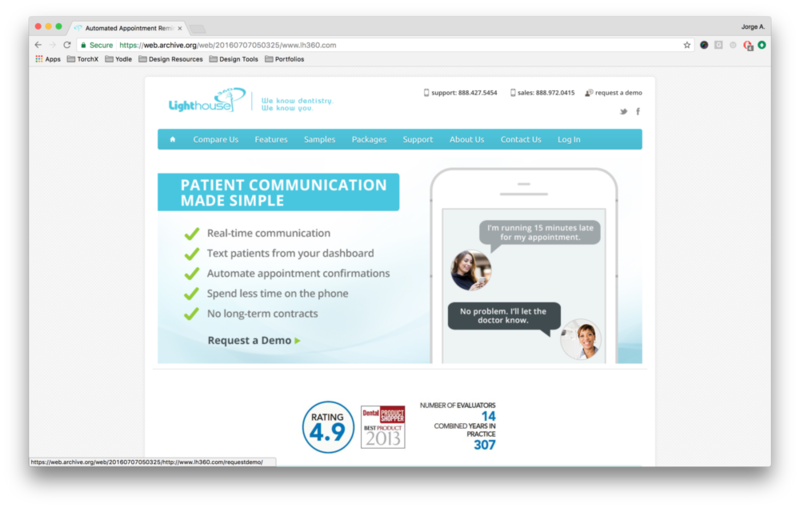 We redesigned the website for Lighthouse, a patient communication software for dental practices. Our cross-functional team went through multiple rounds of research, testing and design iterations, scrutinizing words, animations, and everything in between. The new website drives credibility and conversions, and is a powerful tool for our sales team. Believe it or not, patient communication software for dental practices is a competitive space. Lighthouse tapped into that market early on and is now an established player, but it was time to revamp its website in order to stand out among its competitors. Of course, it wasn't just a desire to improve the aesthetics that was driving the redesign effort. Usability issues and a strategy that leaned a little too hard on business objectives ("Hey! Check out all our features!") was leaving visitors astray, unable to easily digest the website's content and finding themselves pulled in multiple directions. With this in mind, our primary audience would be prospective customers (practice owners, front-desk administrators), and our secondary audience would be current customers. With a focused strategy, target audiences, and clear goals for the redesigned website, my role was now to lead the UX design efforts to define the navigational structure of the new website. We moved forward with a version of the navigation that encouraged users to learn what the software does (value proposition & features), validate our claims (customer testimonials), meet the real people behind the software (about us), and lastly, request a free demo. Since this supported our primary audience's needs and our business objectives, this flow was quite literally mirrored in the organization and hierarchy of the main navigation. This version of the main navigation also tested better with users, (percentage of task completion). We also split out important links for our secondary audience in a utility bar above the top navigation, so current customers could quickly log in, access resources, or call customer support. Once we aligned on a version of the home page + navigation, I moved on to build out layout, content and hierarchy for rest of the pages. I worked closely with product marketing and an excellent copywriter to flesh out the rest of the experience. Throughout weekly check-ins and one-off meetings, we finalized the experience for the rest of the website, while our visual designer & creative director tested messaging and visual concepts with users. Keep the "Samples" page, since it was heavily referenced by our Sales team, but link to it only from the footer. The main use case for the page was for sales representatives to send prospective customers a link to it via email. It wasn't an important step in our primary audience's journey. The same decision applied for "Partner Programs" and "Supported Platforms". The marketing team developed a resource hub with articles for dental practices. In a similar vein, we didn't want it to dilute the experience, but given business needs we had to prioritize it beyond the footer. We decided to link to it from the utility bar, keeping it separate from the primary customer journey. You can check out the final version of the wireframes here. It felt like we were almost at the end of the marathon, until someone in our team had a great, albeit last-minute, idea to really make the experience memorable 👌. We had a plethora of data we had surveyed from our current client base - why not leverage that to prove our software could really do what the website was claiming? The team saw this as an opportunity to build something unique that wasn't static content, and could still support one of the key steps in our primary audience's journey (increase credibility). We had to work quickly and collaboratively to not delay the site launch, so we all drew inspiration from other products that were leveraging data in a similar fashion. We moved right into visual design to explore compelling ways to display this data. We landed on an illustration-driven concept with simple data visualizations that would animate as the user scrolled down the page, encouraging them to keep exploring and learning about how Lighthouse has helped other dental practices. The redesigned website has become instrumental in supporting our product marketing and inbound sales efforts. We're in the process of assessing the impact in conversion, since the legacy website wasn't properly tracking metrics. If you have a minute, please check it out at www.lh360.com. We're super proud of what we accomplished!